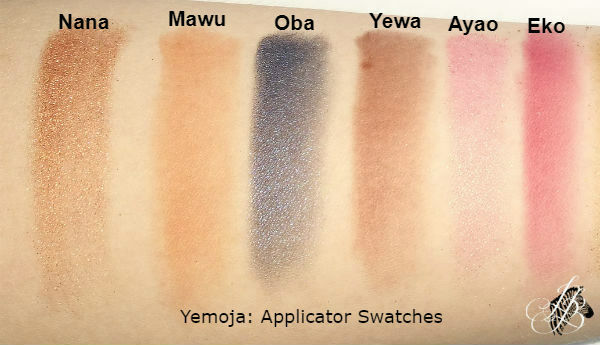 I stumbled across news of this Yemoja palette while watching the ‘Beauty News’ YouTube channel. The same channel that has become famous for destroying make-up but which also does a great round up of new products being announced or released. 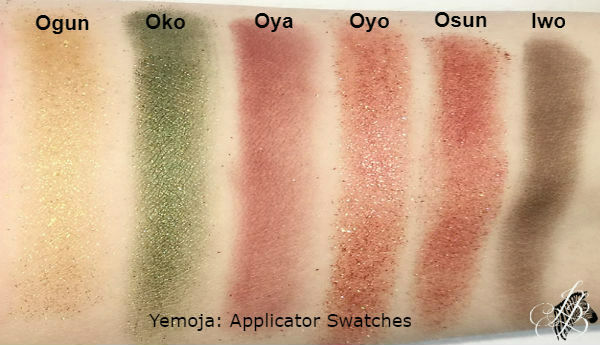 I had never heard of OPV before but I knew I absolutely had to have a palette dedicated to Yemoja so I paused the video and immediately looked them up. I patiently waited for it to be released and placed my order as soon as I could, it arrived in the post a week or so ago along with a pair of false lashes which had been put in for free – great extra touch. 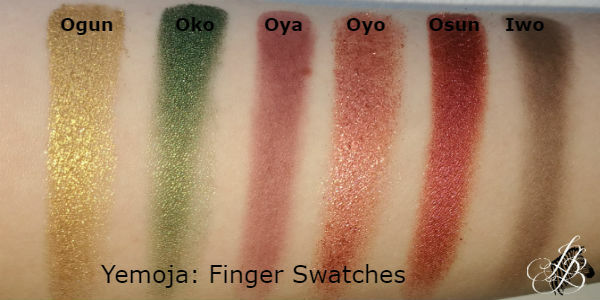 It is very similar in layout and appearance to the Juvia’s Place palettes. I’m not able to compare the quality as I don’t (yet) own any Juvia’s palettes. 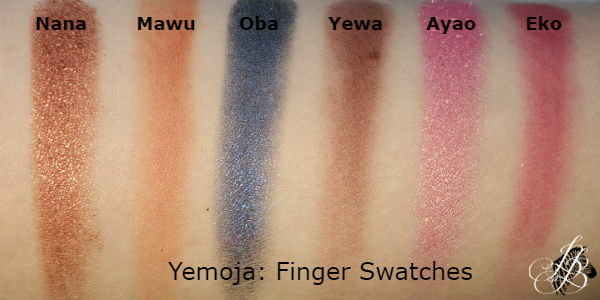 I am in desperate want of the ‘Magic’ palette for similar reasons to why I bought this one – the African mythology. is. The pans are the same width as one of the Juvia’s place palettes but not the same formula so I wouldn’t like to hazard a guess at the amount of product. The shadows themselves vary in quality from one to the next. They seem to perform much better on the eye over primer than they do as swatches. All bar three shades are named after a Yoruba Orisha spirit; Nana Bukuu, is the mother Supreme Creator who gave birth to the moon spirit Mawu. Oba is traditionally identified as the first wife of Shango. Yewa is a jealous virgin Orisha while Ayao is the Orisha of the air. Ogun is the spirit of iron, while Orisha Oko is a hunter and spirit of the yam harvest. Oya is the spirit of the wind and lightning, while Osun is a river spirit (as well as the name of a Nigerian state.) The other three are named after places in Nigeria; Eko is named for Lagos state in Nigeria, Oyo is named for Oyo state and Iwo is a town in Oshun state. There are a total of 12 shadows: 5 mattes, 4 shimmers and 3 that I would describe as glitters. As you can see the matte shades perform much better with the applicator but the glittery shades come into their own when you use your fingers. They quite remind me of some the textured shadows from the Huda Beauty palette in that respect. The mattes blend well on the eye over a base of Urban Decay Primer potion set with a translucent powder. I found a glitter glue such as the one by NYX to be very helpful with the glittery shades. I did experience some fall out while applying these even with my finger. It is possible to get them to go on with a dampened brush as well but a finger is still better. My favourite shades from this palette are ‘Nana’, a beautifully smooth red-copper and ‘Ayao’ which is an unusual pink with gold reflects. OPV are a London based brand whose owners are Nigerian. The Yemoja palette was made in China. This seems to be their first palette that’s unique to them, the others are the same 35 shade palettes loads of companies have their names stamped onto. I hope they can sustain the move towards more individual products like this one. Overall while this might not be unique in terms of formula it is fairly unique in terms of theme and idea and for that alone I love it. The shadows are variable but absolutely workable and worthwhile and there seems to be quite a large amount of product in each pan. Would I re-purchase? Probably yes I would. I’ll also be keeping an eye on the brand to see if they produce anything else along these lines. Next > Skincare Jargon Busting: Types of Spot! It is – I hear there’s already a sequel dedicated to Oshun in the works too!